Did your best friend move away to college? Perhaps they finally landed that dream job and set sail (so to speak) for a place far far away. Maybe your sibling lives in a different state or city. Even if the person you’re missing lives right next door, perhaps you’ve drifted apart the last few weeks — or years. 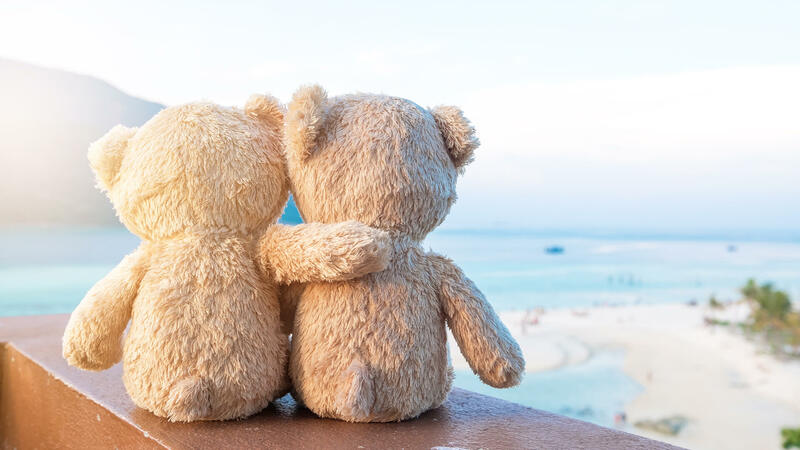 Regardless of how long you’ve been separated — figuratively or literally — you can always reconnect when you’re ready. All you have to do is say the word[s] — I miss you. Telling someone that you’re missing them with I miss you cards is the small gesture that has a big effect. You may not be able to go back to how things were before, but there’s always opportunity to start things anew. Getting a fresh start to any relationship requires someone to reach out. Sure, you could send a quick text, but that won’t have the same effect. 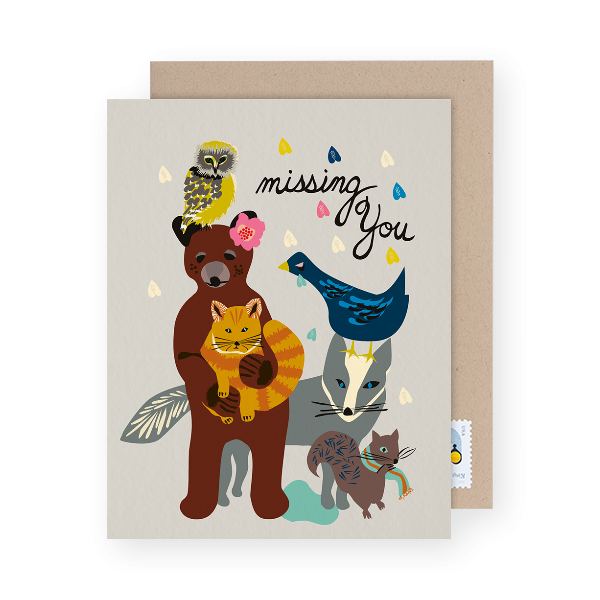 Make a statement by sending I miss you cards to those in your life you’d like to get back in touch with. For those people that are far away, starting to pen pal with each other is a great way to instantly reconnect. Catching up on all the things you may have missed in each other’s lives is way more fun with adorable snail mail. Emails are nice and quick, but they simply don’t have the same effect as snail mail. When was the last time you got excited about an email? Never. That’s when. 1. All the animals missing you. 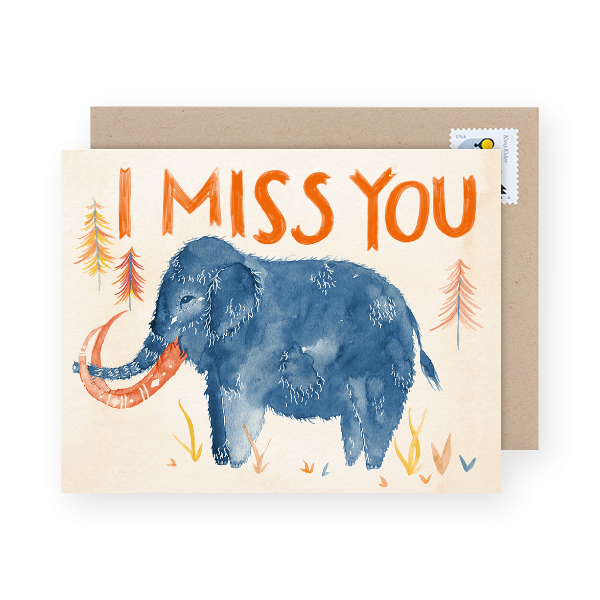 First of all, can we talk about how beautiful the illustration is on this missing you card by Elizabeth Grubaugh? Is the recipient of the intended card an animal fan? Perhaps you’re going for a warm reintroduction. This missing you card gives off all the warmest feelings. Write your message and send this card here. 2. Thoughtful thinking of you. Another beautiful illustration, this one by Quill & Fox, this card is a lovely way to say hello. 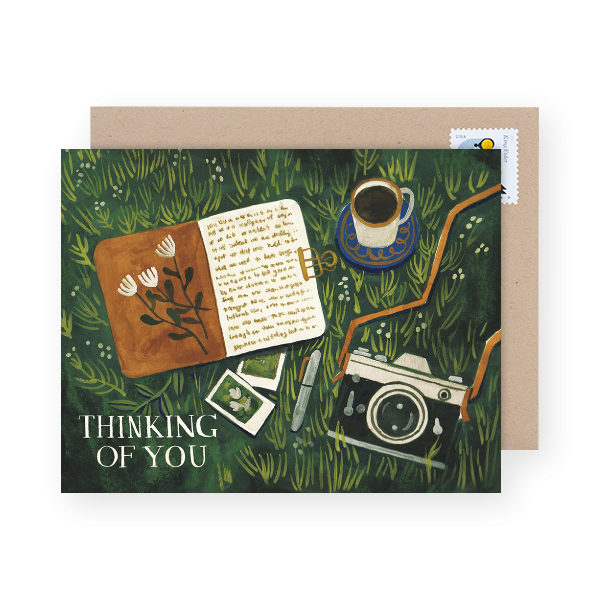 If this scene of journalling, coffee and vintage photos rings true with you — it’ll be a perfect way to remind your old friend of your warm nature. Also, who wouldn’t love receiving something so nice? Write your personal message and send this card here. 3. I miss your face. That’s one way to tell someone how much you miss them. We love the details on this miss you card by E. Frances. The intricate work is ever more impressive with the watercolor medium. Write your personal message and send this card here. 4. Elephant I miss you. ‘I miss you THIS much’ [as much as an elephant]! Make sure they know just how much you miss them with this stunning illustration by Meera Lee Patel. Perfect for the person who appreciates the magical beauty of elephants. Write your message and send this card here. 5. For your Netflix buddy. Miss your Netflix buddy? Who would blame you? 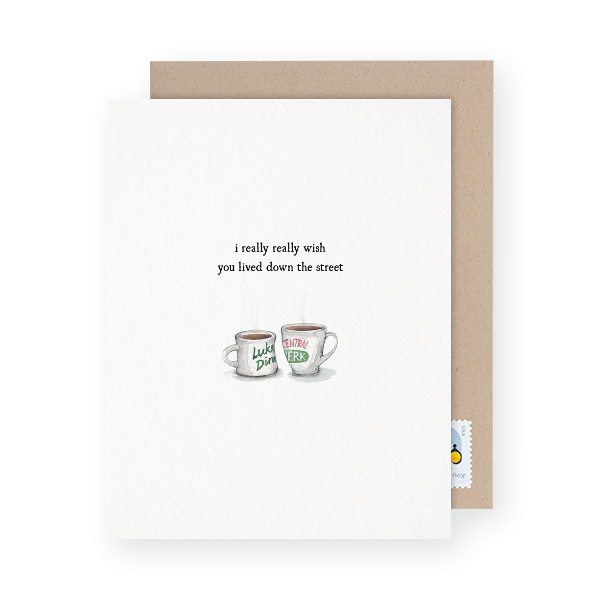 Binging on Friends and Gilmore Girls just isn’t the same without them — let them know with this adorable card by E. Frances Paper. Who knows!? Maybe this reconnection will start new long-distance Netflix date nights. Write your personal message send this card here. For the inner poet in all of us. 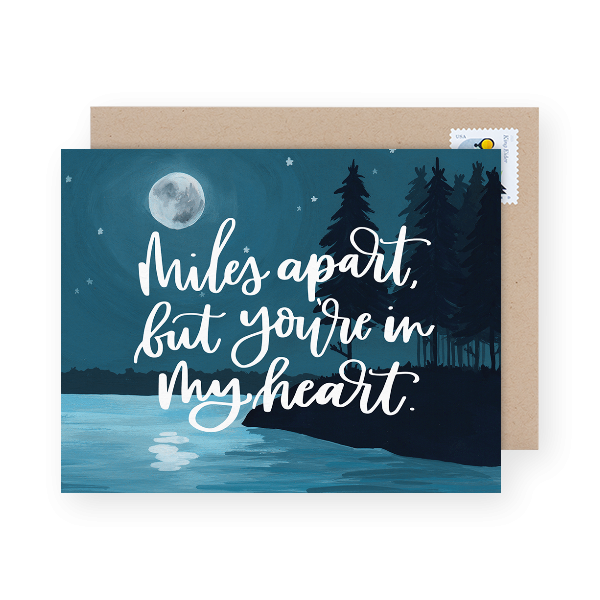 This missing you card by One Canoe Two would be perfect for the bestie that moved away last month or your long distance sweetheart. Whoever you’re missing, this beautiful design will melt their heart. We love the deep blue colors on this card! Write your personal message and send this card here. 7. Waiting for your return. Patiently waiting for your friend (or soulmate) to return? 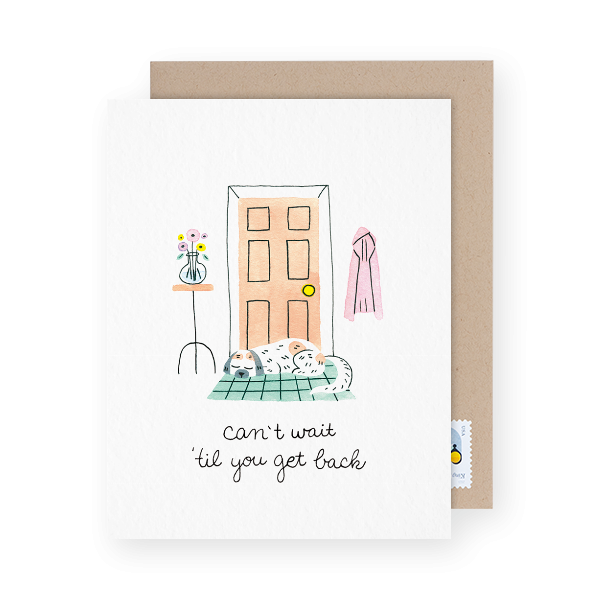 What better way to tell them you’re missing them than with an adorable card like this one by Katie Pea Studio? Write your personal message and send this card here. 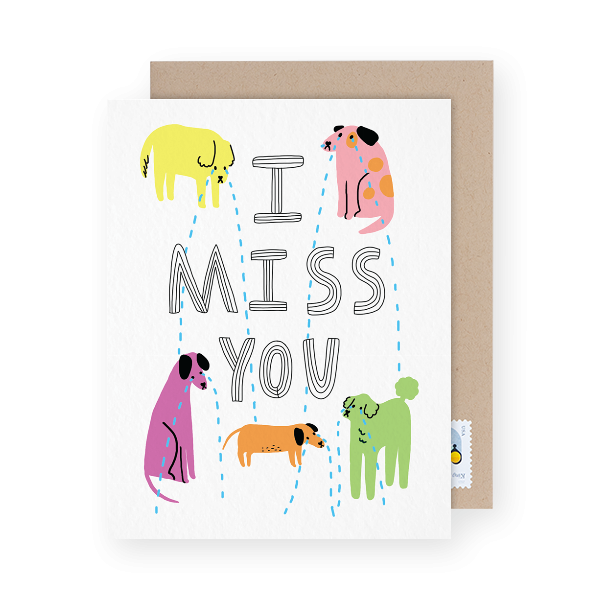 Ok, so who could possibly resist such a cute I Miss You card. 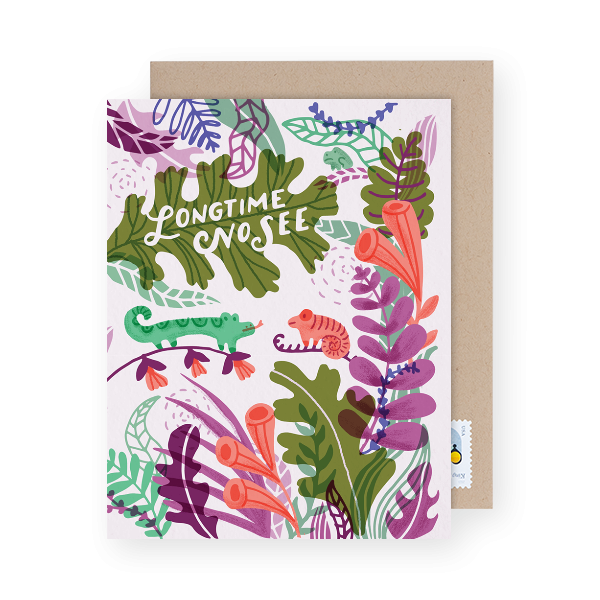 If you’re trying to stir up some emotions, this card by Sussie Esse couldn’t be more perfect. Write and send this card here. 9. Plant wish you were here. 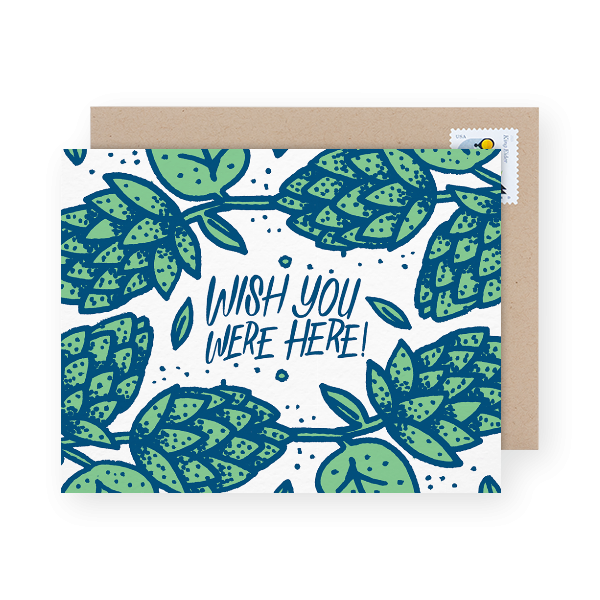 One of Postable’s newest I miss you cards, this design by Bench Pressed would be appreciated by just about anyone. Tell them just how much you wish they were there with you doing all the fun things [aka fill in the blanks]. Write your personal message and send this card here. 10. I miss your stupid face. Ok, so that’s another way of telling someone you miss them. If you have a certain type of relationship with your miss-ee — one in which the recipient will totally understand the sentiment. Near Modern Disaster has a special way of saying things and this card is no exception. With the simplicity and simultaneous quirky typography, you’ll no doubt illicit a giggle (or two) from your far-away buddy. Write your personal message and send this card here. 11. Jungle long time no see. We love the almost camouflage design of this card by There Will Be Cake. Not to mention how beautiful the illustrations are. 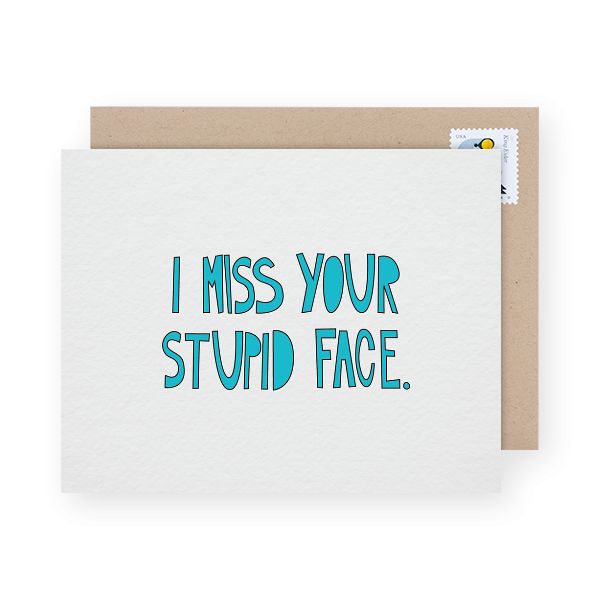 This miss you card is frame worthy so whoever you decide to mail it to, will surely appreciate the gesture and reach back out in no time. Write your personal message and send this card here. How much do you really miss them? That’s the real question. Make sure they know! Write a personal message that makes them feel all the feels. Keep your messaging short — remember, you’re not writing a novel. Write something short and sweet, but definitely include a little something about why you miss them. Choose the card that speaks to you and remember — you can mail it without ever leaving your computer. 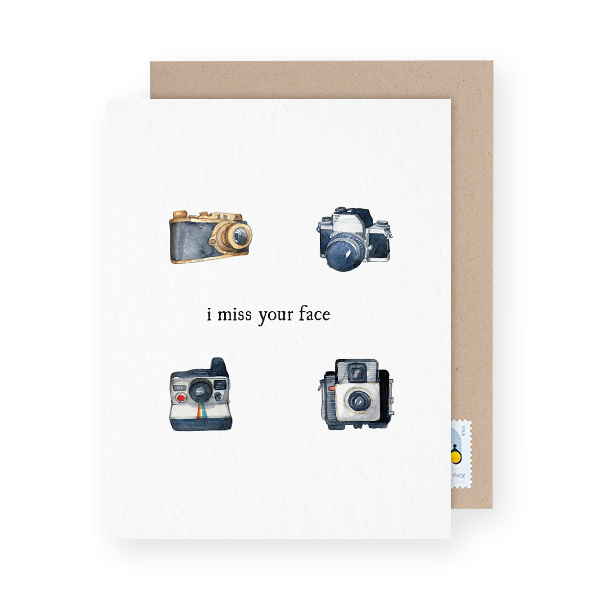 Question is — which of these I miss you cards will you send?